Of course, she got her dress. You knew she'd get the dress, right? After her not-so-subtle plea, she never let up (such is the plight of the youngest child), asking each and every time she popped into my studio, "You makin' my Christmas dress, Mama?" followed by an incredulous "Why?!" whenever the answer was 'not yet'. When it was finally complete and I tried it on her, her immediate response was, 'My no like it. Take it off." Oh, yes, that's just what she did. Thankfully though, with the allure of new tights on Christmas morning (it's official that all my kids think tights are the most fabulous clothing article of all. And if I had tights with snowflakes on them I would have to agree), she happily wore the dress long enough for Christmas brunch, and even for one more party after that. Yay! 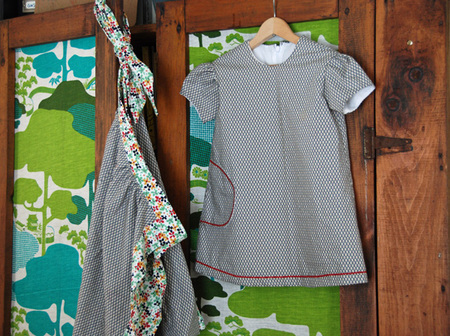 The fabric is by Maywood Studio. The pattern is a vintage one. I eliminated the lace, and added a little bit of baby rickrack instead. Because red baby rickrack belongs with the holidays as much as eggnog does, as far as I'm concerned. I can't resist these things. 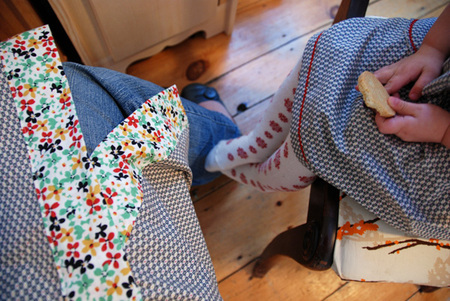 And to continue our matchy holiday outfit tradition for the third year in a row, I made myself this apron. The pattern is the Apron Overlay from the Amy Butler Barcelona Skirt pattern. It's a great pattern - easy to follow and quick to whip up, and I was quite happy to wear it Christmas morning, but I'm not such a fan of how it fit - perhaps my sizing was off. Or perhaps my waist has moved. Surely it was the pattern. Ahem. I know I swore a zillion times over before having children, that I would never do this matching clothes thing to my kids. But whatever, I'll happily eat those words now and continue sewing for just a few moments of fun, silly, and sweet with my baby girl. We like it.